Welcome on the webblog of Barontoo, the first Belgian blog listed as a WAYMARK. 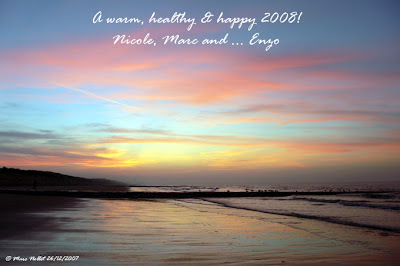 I started this blog in July 2005 in my mothertongue Dutch. But since it is listed as a Waymark I continue to write my comments in English. So take a look at it, post somewhere a comment and do not forget to log it! To do so click on the 1st link in the left frame hereunder and click then on "Visit Waymark (Post log)". Thanks! From February 2 till February 7 I was in Miami Beach or a medical congress. On a free day I hired a decobike and did a tour in the city. Suddenly I arrived on a spot were a geocache was hidden. I had read this at home. I did not have my GPS but I started to look for it. After a while I found the magnetic "Cache for Veterans" (GC2HZXB). I logged and left a small geocoin. I found a geocache today! Today while making a walk with the family (I.e. my 2 sisters and their partners) between Wenduine and Blankenberge I found a geocache! No, is not that special, but I am not often geocaching this year. It's rather exceptional that I find one. Most of the time I am out in the nature to take pictures, most of these pictures of birds. And almost every weekend I am "logging" some picture on Flickr. Interested? You can find my work by clicking here. Enjoy it! This evening at 5PM geocachers will meet each other in the bar of the sporthall Poseidon at Woluwé-Saint-Lambert in Brussels. Already 29 left a "Will attend" log. I will also be there. Hope to greet there some friends and to meet some new members. There are already a lot of TB's and I will take a part of my geocoins collection so that they all can log these. Looking out to meet and greet you all! It's grey outside ... Winter is coming. First snow yesterday in Brussels. Sorry, I am terribly sorry. I did not used this blogspot for a long time. But now that it was visited by a friendly geocacher who reminded me this website, I will do my very best to write from time to time a new note. WWFM IV event (Bredene) "Enzo's party"
Today I organised a WWFM IV event in Bredene. You can find it here. At 7PM from everywhere in the park geocachers were coming to my car to give Enzo a small present and to sign the logbook. 22 geocachers and a total of 36 persons were present. Afterwards, that is at 7.15PM (!) most of them went together to the "Hypodroom" were we had a good time, having a beer (or more), talking about geocaching (what else?) and swapping geocoins. It was a great evening. The WWFM events are organised around the world. it is an idea of Podcacher, a famous geocacher. Visit his website for more information. 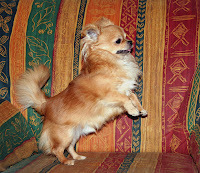 As Schnuffel was going home today I promised her to bring her to the Brussels National aeroport. But we still had to finish the series of caches we started on Wednesday (see hereunder). There was still one cache we had to find before starting the final one. The first was rather easy to find and we were surprised to find also the last one rather quickly. So we had some time left and could find some more caches on our way to the aeroport. You will find these in our logs. Herzlichen Dank Scnuffel for visiting Brussels and going geocaching with me. It is great to have you as a geocaching friend! Today I met Schnuffel from Austria in the center of Brussels. We started our geocaching tour with "Vierling of beter De Gelukte Overval" of Lord Cunning, a famous geocacher who started on June 16, 2001 with geocaching! After having found 4 of the 5 caches of this series it was to dark to continue our search so we went for a nice Italian restaurant. It was great Schnuffel caching with you. When will we continue our search? For the first time in my geocachinglife (that started end 2001) I had to take my pants (and shoes and socks)out to find a WP! I do not tell anything more but if you are at the Belgian coastside you should try to find the cache "On the beach" of Bredene! Early this morning I came home at 4 o'clock! With my geocachingbuddies (mnous, Teofiel, Datts, Merel, Speerpunt, JeePeeS and Testom) we started yesterday evening to look for the cache "From Mission to Madness" of Carte Blanche. We had to look for LED's (instead of tags) in the dark woods of the Ardennes. We found the stash after a walk of 11,1 km in something more than 3 houres. You have to do this cache if you like to do some nightcaching! It is a superb cache. Afterwards we found a local dancing where we had some beers with the whole team! Here we found the "Madness"! Do you know the story of Peter Pan? Of course ... But do you know the story of the statue of Peter Pan? 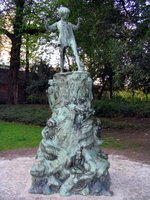 Well, from now on you can (as geocacher) learn everything about that statue (and it's copies) if you start searching where this statue stays in Brussels, or in London, or Liverpool, or St.John's (Newfoundland)or in Toronto, or in Camden (New Jersey) or even in Perth in Autralia! Read the description carefully and start making geo-friends all over the world. Good luck! Fro those who want to start in Brussels, just click here. "We will drink a glass of water for our Valentine" so said my wife! You have to know that we are both at home with a serious flu! I could not go to work on Tuesday and since then I can not see any food, only a coffee or a Coke light and a lot of water I can drink. And I sleep most of the time. I did not know that I can sleep that much. And when I am awake, I am not motivate to do something. I even do not answer my e-mails! Looking out of the window, I saw that the building in front of our home is almost finished. I published here already some pictures (the first on February 19, 2006 and then on March 13 and September 3, 2006) of this construction site. Now, almost 2 years later it is almost ready to receive the first new neighbours. 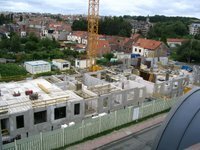 In the meantime my cache "Stop building in Woluwe" has been found by 226 geocachers and is thus one of the most visited caches in Belgium. This morning I left home to geoaching with mnous, Speerpunt and Yelista, 3 very dedicated geocaching buds. We decided to drive to Antwerp where a lot of caches were waiting for us. Our first cache we found on the way to Antwerp, just outside Brussels, at 8:30 AM. The last one we did today was lying on the left bank of the river Scheldt in Antwerp. It was the 20st cache we found today at 4:55 PM. And we had also 2 DNF (Did not find). The 4th one we found was my 1,500st cache! So I had to offer my friends a beer. Therefor we went to "Café Beveren", at the Vlasmarkt 1 in Antwerp. There still a full automatic Decap organ is playing some old songs. Since last Friday we are in our small house at the Belgian coast side. 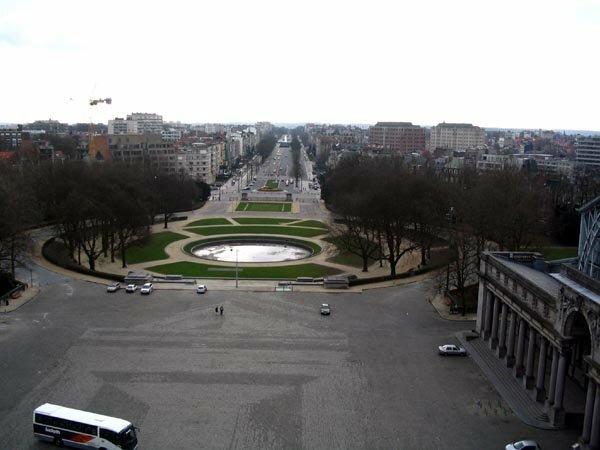 We are taking some days off and will return on the first day of the new year to Brussels. As all geocaches are found here, I had to look for something else to do. And as I like to make long hiking trips, I often went walking in the polder. And that is now just the right time to do so! More than 35,000 geese are staying in the neighborhood for their "hollidays"! Ever heard of Second Life (SL)? Of course you have. And for those who don't, well click here! And download the program here and start a new life in a 3-D virtual world. After a few steps you will see what possibilties you have in SL. Much more that in RL (=Real Life)! And believe it or not: one can do geocaching in SL! You can find traditionals, multi's and .. specials. To find a cache you will need a description and the start co-ordinates. You can find these on http://www.slgeocaching.com/! Give it a try and go out in SL to find your first geocache. Start with an easy one, just as in RL. Good hunting! Today I became a member of Quality Caching. A few Dutch members of geocaching.com started a new website where only high quality caches are accepted. A small traditional along a highway will never be accepted on this site. All caches must be long walks or bike tours where the landscape, the places one passes, ... are worth seeing. So caches leads you to the most beautiful places in the Netherlands, in Belgium and in Luxembourg (Benelux). Most of the site is written in Dutch but there are already some caches published in English. The description gives always a lot of information in a perfect language and also the logs are written without any abbreviations! Yesterday and today more than 150 geocachers came to the Belgian Coast for the FKK Event organised by Lucky Kesj, Geowitch and Barontoo. They were all very glad with a perfect organisation, as we could read afterwards in their logs. It all started on Saturday morning around 9AM were we welcomed the cachers and their families with a nice cup of coffee. They all received the description of 16 new caches! But we expected them all back at 7PM for a tasteful BBQ. At 10PM they received the description ofr the night cache. Just when it started the rain began to fall. But a geocacher is not a geocacher if the rain stops him! So they all went for it and the first group arrived at 11.55PM at the cache. The last group found it at 1.40AM on Sunday morning. The second day the rain stopped in the morning and off they went again. Looking for caches in the sand, in the dunes, in the surrounding villages ... and even the sun appeared during the day. Just have a look at their logs and you will see that if you were not there, you have missed something! Today I bought a bike! Not just a ordinary bike but a Giant Revive! I will use it most during our stays at the Belgian coast side. The same day I left home for a tour of 15 km and I was surprised how easy it is to use this bike. It fits easily in my car and so I can take it where ever in the country to search for geocaches by bike. I am sure I will have a lot of fun on my Revive! On Saturday Juin 30 and Sunday July 1, 2006 Lucky kesj, Geowitch and I, Barontoo are organizing a geocaching event at the Belgian coast. We are placing 15 new caches along the coast side from Oostduinkerke to Zeebruges. All WP's are already placed, we only have to hide the stashes. All caches are approved and waiting to be published. It all starts at 9AM when the description of the caches will be given to the geocachers . In the evening arround 7PM we will all come together for a barbeque in the Camping "Ter Hoeve". Afterwards starts the night cache. It is a walk starting in Bredene, through the dunes and over the nudist beach. Let's hope that the weather will be good. I had some frequent flyer miles to spend, so I decided to fly to Frankfurt and to look there for some caches. I arrived around 8.30 AM on the Frankfurter Airport and tried to find my way to the nearby TB Hotel. It was impossible to leave the airport by feet: one should have a car there! I did not, so I took the train to the city center. Arriving in the railway station of Frankfurt I could find my first cache. This was the start of a day of caching: I searched 13 caches and could find 10. I found the final coords of the 3 caches I did not log, but it was impossible to search for these traditionals. To many muggles were arround the stash place. Anyway, I was glad with my 10 found and ... I visited a beautiful city thanks to geocaching! Today I finally arrived in this quest. Last year in the Coin Quest I ended as 3rd Belgian geocacher on the 215th place. This year I was the first Belgian cacher who ended on the 301st place! The 16 requirements were this time not so easy to find but in 19 days I could open the cryptex after finding 16 different caches. I enjoyed very much this worldwide game and hope that the second Belgian player Merel will soon finish his quest. I wish him a lot of luck. On thursday 30 November and Friday 1 December I was in Figueres in Spain (the city of Dali) for my work. I did some house hunting as a team of our company will soon have to move to this city as the civil construction works of the high-speed line between Spain and France are nearly done and then we are in charge of the equipment of the line. 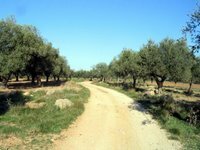 On Friday I had an hour to spend, so I took the car and went to find ""Los Olivos" by peperos. 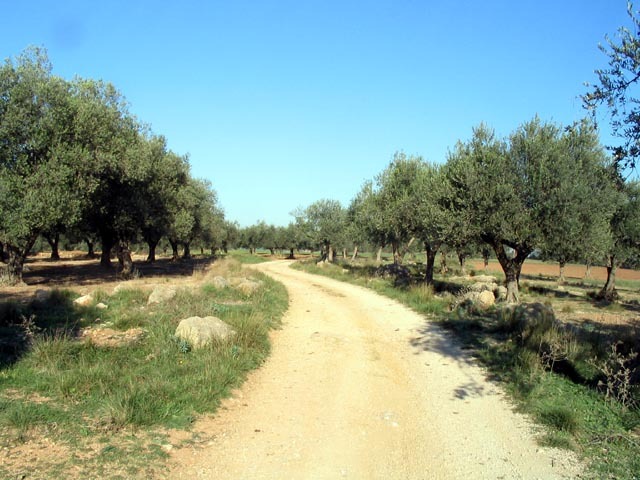 I enjoyed very much the good weather and the approach of the cache between the olive trees was just beautiful. I found the cache rather easily and logged at 11.45 AM. Today in a treat on the forum of geocaching.be, a cacher was asking for URL's of blogs of geocachers. This blog was mentioned in one of the answers. So I suppose that it will be visited more often now and as my blog is a Waymark, some of the Belgian cachers will log this blog at waymarking.com. One can find it here. Only 5 visitors logged it till today. Together with Geowitch and Lucky kesj, I went to Roosendaal in the Netherlands to be part of the Halloween-event, organised by Team KarNie. We were surprised that, after receiving the descriptions of the caches, these were all temporary caches and thus not loggable on the .com site! I must admit that we were not motivated to search for these caches. We were lucky that Geowitch had also taken the descriptions of other caches in the neigborhood and went for these ones. Before starting with the night cache of that event, we had already found 7 "real" caches. Together with the night cache and an attend for the event (even without a logbook) we could later that night log 9 caches. Today I went to search a cache of Yohan, "De Oude Spoorwegberm - Waarloos", together with my wife and 2 friends of us, geomuggles. We enjoyed very much this multi-cache, a walk on an old railway line. I discovered rather quickly the stash, but let the muggles search for it. They were surprised to see how the box was hidden just where a lot of muggles enter a beautiful nature reserve without seeing it. After I wrote my log I was proud to announce them that this was for me the 1,000th cache I found! A few days later the geo-muggles phoned me and asked me if I could lend them a GPS. They want to give geocaching a try! From the 19th till the 29th of September I was in Italy for a holliday together with our American cousins, Pat and Mike. We visited first Rome, hired then a car and drove through Tuscany to Firenze and after a visit of 3 days we continued to Venezia where we also stayed for 3 days. During this trip I was able to do some Italian caches. 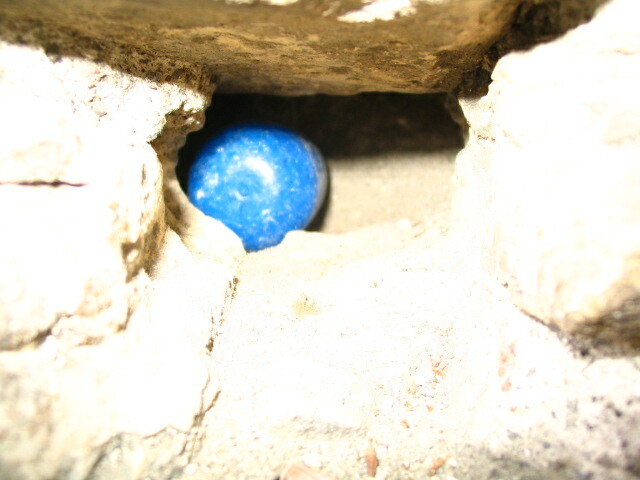 I will always remember a cache hidden in a hole in the wall of the Vatican City. I could just touch it and not take it out of its hidding place. I had to log a DNF. But I could find 2 caches in Rome, 2 in Firenze and 5 in Venezia. This was the forecast for today. So what can one do: try to solve some puzzle caches as these ones and surf on the Internet. And found also The Caching Pump. Listen before you go out caching. B.t.w. The construction in front of our home is growing slowly. See my blog of Februari 19. On Saturday September 26 and Sunday 27, I was present together with other members of our team Enjoy, at this Mega event organised by the board of Geocaching Belgium. The Saturday morning started with 12 caches. And on every starting point one could find the answers to log a special one. The 13 cache of that day. In the evening almost 100 cachers were ready for the nightcache. It was a difficult one, not only to find your way through the woods and the answers on evenry WP but it was also a very long walk. We did it in 4.5 hours. But we did a good job. We ended second with 5 mistakes, only one more than the winner. After a short night we continued to search for some new caches in this beautiful region. At the end of the weekend I could log 23 caches! Today I was present at an event organised by 2 Belgian geocachers in a small village in the south of Brabant Walloon. It was a very good organised event. The written press, a local radiostation and even a camera-man with interviewer were present together with a lot of geocachers and "géomoldus" (=muggles). These last ones were very intersted in our sport and I hope that they will soon become new geocachers. I enjoyed searching all those beautiful caches in and around Perwez. This blogspot is one year old! A year ago I started with this blogspot. Soon after the first blogs I listed it as a WAYMARK. In this year "Barontoo's Blogspot" has 31 records. Waymarking is in my opinion not so successfull as the locationless caches. But the more waymarks are created the more visitors will come on the waymarking website and perhaps on this blogspot. What do you think about it? Post your comments here and do not forget to log your visit. Greetings from Brussels, Belgium! This day started rather sad. My uncle Maurice, the man of my mother's sister, died a few days before and today we went to his funeral. After the funeral repast we left the family for our cottage in Bredene. We were invited by Merel, to join other geocachers for a superb barbecue party in his house in Blankenberge. We were happy to meet of course Merel and En_ik, hh1 and Topaz I, Speerpunt and Yelista, Datts, Inkesa from the Neteherlands, both last with their partners, and last but not least the Black_Jack_Team from Germany. It was a very nice evening full of geocaching stories and a lot of beautiful geocoins! On Saturday July 1, 2006 three colleagues form the Czech Republik arrived in Brussels. My company asked me to show them around, especially to show them the new high-speed railway line we are building between Liège and the German Border. 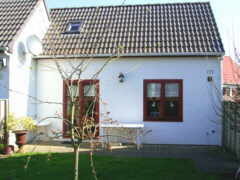 Today we became the owners of a small cottage in a holiday park in Bredene at the Belgian coast. From now we will come almost every weekend to our cottage and I will have the possibility to search some caches along the coast and in the region of Bruges. Today NEMEC, a well known Belgian geocacher, organised an event and at that occasion we distributed our first geocoin. A lot of Belgian geocachers came to pick up their pre-ordered coins. All reactions were very positive: the first Belgian geocoin is a beauty! Today Hanne together with her daughter Manuela arrived by Thalys in Brussels. They will stay till Thursday in our home. Shall I find some time to search a cache or will I have to play for local guide during their stay ...? I found my last 24 caches in 3 different countries! 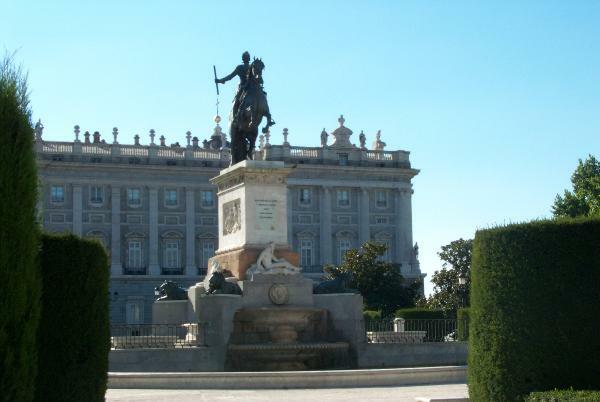 On May 23 and 24, I was for my job in Madrid (Spain). During the night I could find one cache (see hereunder). On May 26, I left Brussels together with my friend geocacher Calocybe, for an event in the South of Paris (France). On our way to the event we found 3 caches. The day after vnc organised the "78 Tour" event. During this splendid day we found 7 caches. There was of course also a night cache we found. And on our way back to Brussels, on Sunday May 28 we could log 3 caches. 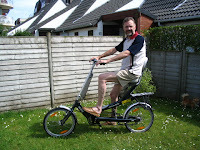 On Monday May 29 I left home for a one week holiday with my wife in the Black Forest (Germany). During our stay there I could search for 11 caches. I logged 9 Found it's and 2 DNF! And I was very glad to meet VidasKasko, a local geocacher. Today I had a meeting in the office of SENER, a engineering office, that is working togeter with "my" company TUC RAIL at the new high-speed line between Perpignan (Fr) and Figueras (Es). 3 FTF's in one day! This morning I saw that some new caches were on-line. Two caches were located in the region of the "Dijleland", a beautiful region in the South of Leuven not so far away from my home. I started with "Dijleland 11: Neerijse". It was a small walk of 3 km where we had to find a chapel that disappeared. It is still on the maps but in reality does not stand any longer at that place. I could easily locate it and a logged a FTF at 09.55h. Then I went to find the "Dijleland 10: Leefdaal". This was a walk of 5 km in a beautiful region. I had to find at 10 different place a picture of a detail of that place and so calculate the postion of the stash. I discovered it at 12.00 h and logged my second FTF of that day. Late in the afternoon I found once again a new cache: "La Source du Thorembais". After a walk of 7 km I found the 3th cache of that day and I could log my third FTF! I returned home with a happy smile on my face. Together with Calocybe and our wifes we spend a great weekend at the Mediterrean Sea. On Friday April 28 we took at 9.25AM a TGV in the Brussels South station and we arrived in the afternoon at 3.39PM in Toulon. There we hired a car to drive to Le Lavandou, where Calocybe is the owner of a small holiday house. On Saturday we walked around in Le Lavandou and enjoyed the good weather. Some people were already swimming in the sea! On Sunday we went all together to do some geocaching. 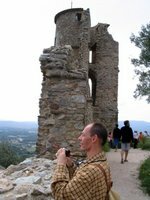 We started with "Le Chateau Grimaud". 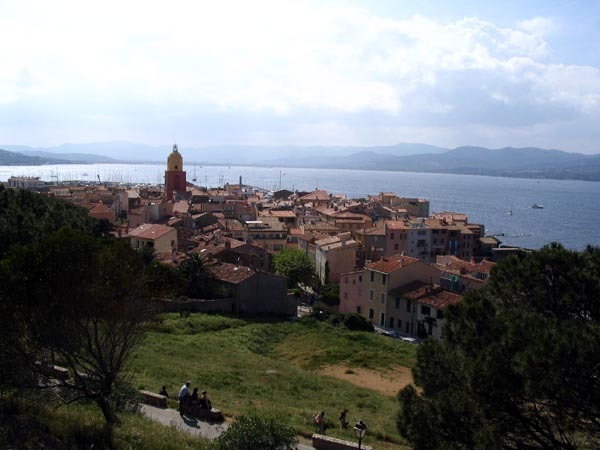 We found the stash rather quickly and we enjoyed the view on the bay of Saint-Tropez and the mill of Grimaud. Next cache we did was "Sur le chemin au St Tropez" (GCGTQ8). We did not find the film cannister as it disappeared already a long time ago. But there was also a possibility to log this one after sending some words we found at the cache place to the owner. This stash is situated in the port of Grimaud, where we even had the possibilty to take the boat! 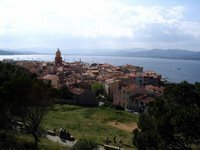 And the last cache of today was situated in St Tropez. The port of this little town was crowded but to find the "Millionaire's View" we had to climb up to the citadel, a fort located on a hill. The view was superb and the cache quickly located but ... not so easy to access. Afterwards we had a beer nearby the magnificent boats in the port. A new cache on a Sunday morning! This one I have to find even before our breakfast. As I know where the Hilton hotel is located it was easy to find a parking place in front of it and enter the small park. I located very quikly the stash, thanks to the hint. Afterwards I made a small walk in this lovely park and took some pictures of the statues. This morning I went to find this new cache in the center of Brussels. I wanted to be the first one to log. At WP1 - just at 9 o'clock - I met the owner: zekats. He came to controle if WP2 was accesible. We agreed to meet each other at the stash and I went to find WP1. All WP's were easy to find after a walk in the park. I could log a FTF at 09:50. Afterwards I did the maintenance of the SABENA cache. Some geocachers were complaining about the bad state of this cache.